Many international HVAC/R organizations promulgate standards for the air filtration industry, and many of these standards become part of a national building code. For the most part, these codes dictate “minimum standards” that must be met to be in compliance with the code. 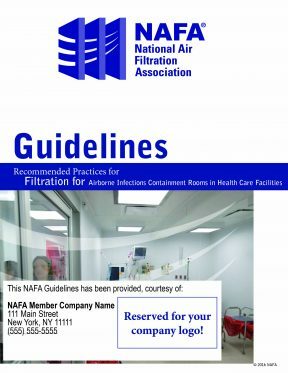 NAFA publishes a series of air filtration best practice guidelines based on these codes, but that go further to recommend and incorporate the “highest level of air filtration standards” for specific applications. Add me to your mailing list. I can unsubscribe anytime. Which Guideline we should create next? Add your organization’s logo to any of our 10 Best Practice Guidelines to distribute to your employees and clients. This is a great way to show that your company is involved in the industry and follows the latest best practices. NAFA publishes this series of air filtration guidelines based on standards that international HVAC/R organizations promote and typically become part of a national building code, but we also take it one step further. We also recommend and incorporate the highest level of air filtration standards for specific applications.